It was July 2015 when Microsoft released Windows 10 at the public level. It received the most positive responses from reviewers across the globe. Particularly, Windows 10 has many significant features and served in a uniquely different manner from the earlier releases of Windows. 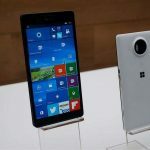 Later, Microsoft announced the release of Lumia 950 smartphone in November, 2015. This smartphone is powered by Windows 10. The smartphone Lumia 950 is not big, but it’s not too small either. It can easily fit in most pockets because of its slim body and rather lightweight construction. This is built excellently with 8.2mm thickness, 145mm height and with the width of 73.2mm. It has a light weight of 150grams. This Widows smartphone has a plastic exchangeable back cover which can be helpful in replacing the battery. The 20-megapixel main camera of Lumia 950 has an auto focus with two-stage capture key. There are three operating keys which include camera key, volume keys, and power or lock key. Continuum is the most prominent feature in Windows 10. It is a big time productivity tool which ultimately enhances the user interface. You can connect your Lumia 950 with external devices for instance monitor, mouse, and keyboard. An adapter or a dock is used for the connection of external devices. As a result, you get to have a PC-like experience that’s powered by your own smartphone. The Lumia 950 features contain 5.2-inch AMOLED touchscreen with a dimension of 2560 x 1440, protected with Gorilla glass 3. On the other hand, it also has the quality of automatic brightness control through ClearBack technology for improved sunlight visibility and enhanced readability. But unlike other Lumia, it does not support features like super sensitive touch.